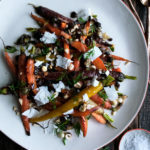 Roasted carrots with scallion vinaigrette, topped with juicy raisins, shaved feta cheese, and roasted hazelnuts. 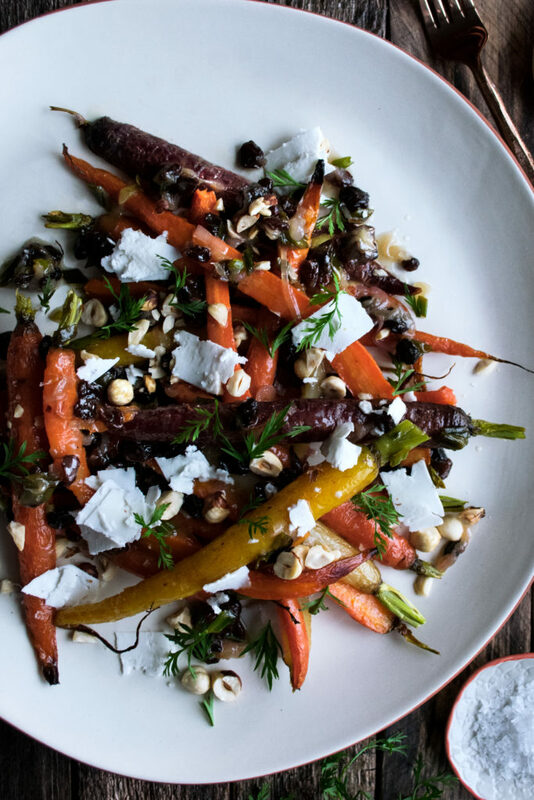 This is the carrot dish of my dreams, and if you like the combination of sweet, salty, nutty, and tangy flavors like me…then I think you’ll think so, too. These roasted carrots with scallion vinaigrette are the perfect showcase of the way I love to cook. 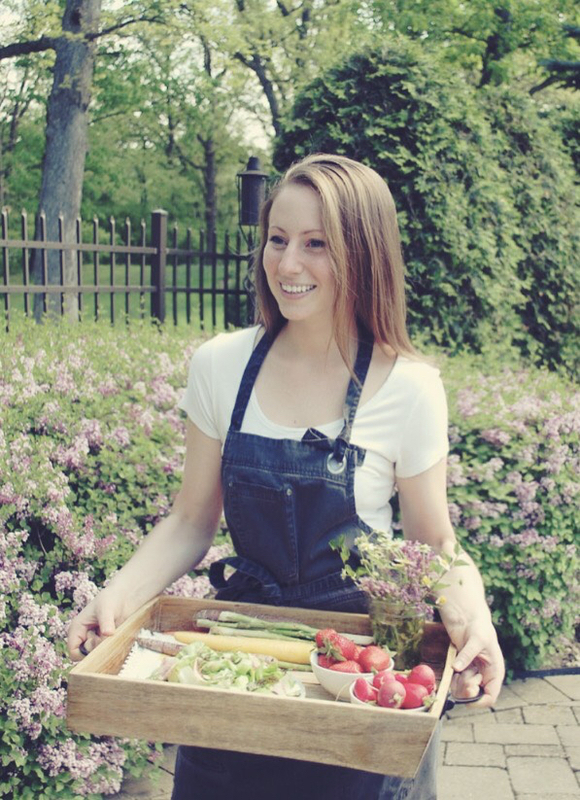 Rustic and simple, highlighting a gorgeous ingredient in an exciting way. Working with flavors to create something unique and bold, yet still approachable. It’s somewhat minimal in process and number of ingredients, while at the same time being high in flavor and completely inspired. You can play with this dish really easily as well – swap out the hazelnuts for walnuts, replace the raisins with currants, or even sub in a sharp manchego cheese for the feta. What I love, too, is that you can make a big batch of these roasted carrots and they work just as well served at a dinner party or for your weeknight leftovers all week long. I had some leftover salmon cakes on hand the same days I had these leftover roasted carrots, and they heated up together like a charm. Enjoy! Heat a medium sauté pan over medium heat. Add the olive oil. When the oil is hot, add the shallots. Cook until tender and caramelized, just a few minutes, stirring often. Lower the heat and toss in the scallions. Continue to cook for another minute. Stir in the white wine vinegar and honey. Let the mixture come to a bubble and simmer for a minute. Turn off the heat. Transfer the mixture to a bowl and slowly drizzle in the neutral oil until emulsified. Fold in the raisins. Season with salt to taste. Let the vinaigrette sit while you make the carrots. Preheat the oven to 425°F. Lay the hazelnuts out onto a baking sheet. Roast for 5 minutes. Let cool just slightly and use a kitchen towel to rub the hazelnuts between your hands in order to remove the skins. Discard the skins. Roughly chop the hazelnuts and set aside. Meanwhile, lay the halved carrots out onto a baking sheet. Toss with enough olive oil to coat them well. Spread them into one, even layer. Season with a pinch of salt. 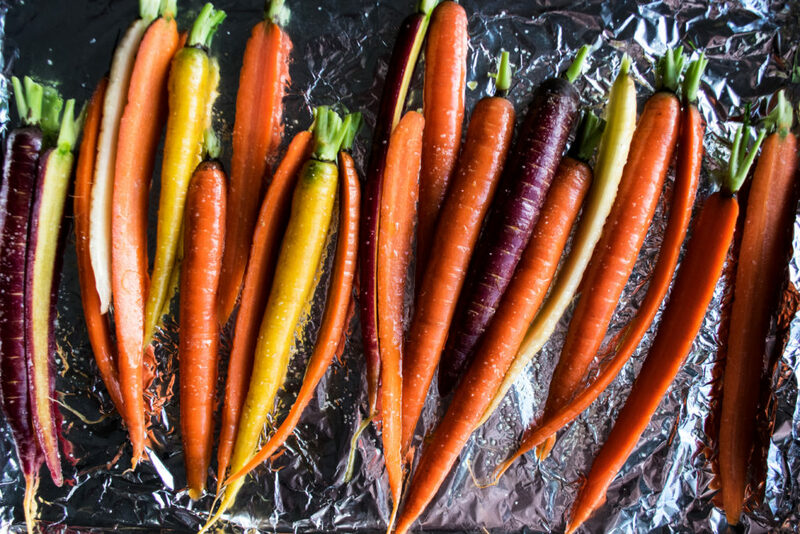 Roast the carrots for 12-15 minutes, or until tender and slightly caramelized (time may vary depending on your oven). 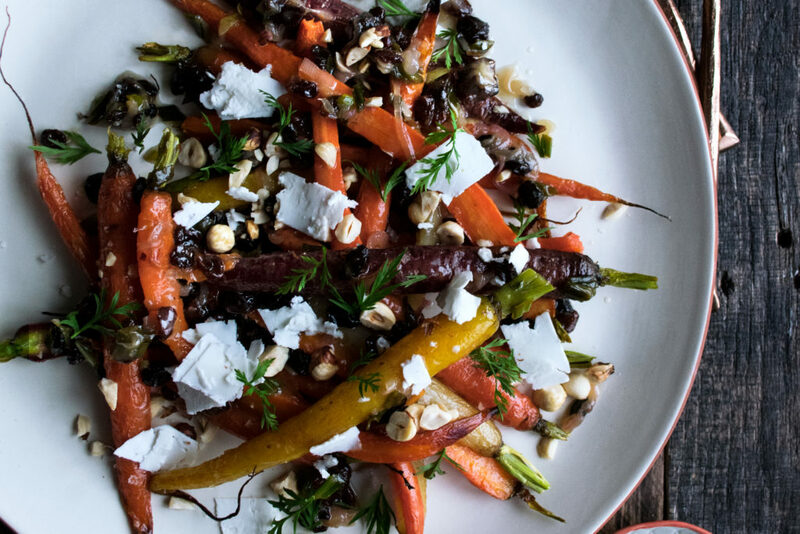 Toss the warm carrots with the scallion vinaigrette. Serve them with the chopped roasted hazelnuts, feta cheese, and carrot top leaves (optional) on top.